Tim Duncan is one of the greatest big men of the modern era. However, his lack of flash and low-key demeanor have kept him from approaching the same hobby level as his other basketball peers, such as Kobe Bryant. Nevertheless, with all his achievements, Tim Duncan cards and memorabilia deserve a place among the greats. Born and raised in the US Virgin Islands, basketball was not a likely landing spot for Tim Duncan. However, as he continued to grow taller, eventually topping out at 6'11", it began to make sense. Duncan accepted a scholarship to play at Wake Forest and helped lead them to at least the second round of the NCAA Tournament in all four seasons with the team. 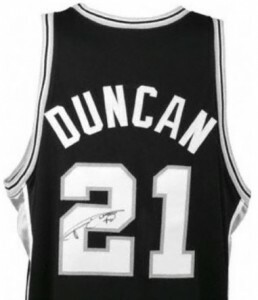 After graduating from Wake Forest in 1997, Duncan declared for the NBA Draft. The San Antonio Spurs had the fortune of the number one overall pick, and there was little question which player they would select. 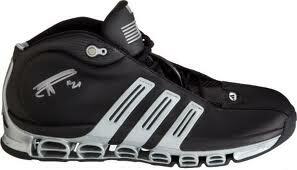 Duncan was paired with another big man, David Robinson, to form one of the most dominant front courts of all-time. Basketball has evolved into a game that seems to be as much about creative dunks and no-look passes as it is about floor spacing and tight defense. Watching Tim Duncan play is almost like watching a flashback to the big men of the past. Block, rebound, score, repeat. Duncan has made a long and successful career out of the fundamentals of the game. Closing in on his forties and with retirement rapidly approaching, Tim Duncan has five NBA Championships, three Finals MVPs, two NBA MVPs, 14 All-Star selections and a Rookie of the Year award in 1998. Tim Duncan has 18 rookie cards and most of them are very reasonably priced. The higher values come from the various parallels. Tim Duncan also has quite a few certified autographed cards which are a great option, although none of his NBA rookie cards are signed. 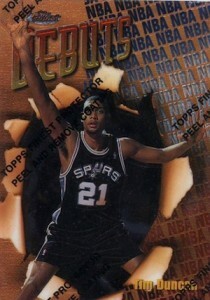 The 1997-98 Topps Chrome Tim Duncan is the number one rookie option for collectors. This action image shows Duncan in his element, dominating the paint. This would become a regular occurrence for many years to come. 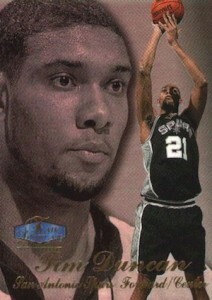 The big draw in 1997-98 Topps Chrome Basketball is the Refractor parallel of Tim Duncan's rookie card. Refractors only fall 1:12 packs and with a checklist of 220 cards, the Duncan Refractor is a very tough card to pull. Flair Showcase relied on nice photography and a glossy finish to achieve an understated elegance. While the Row 3 Tim Duncan card can be had for just a few dollars, the real draw is the various card options in the product. These include Row 2 (1:3 packs), Row 1 (1:16 packs), Row 0 (#/250) and the Legacy Collection (#/100) parallels. One thing is for sure, after seeing this card, collectors knew that someone was making their debut in the NBA. 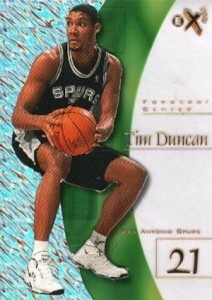 Tim Duncan's Finest rookie card is part of the Bronze subset. 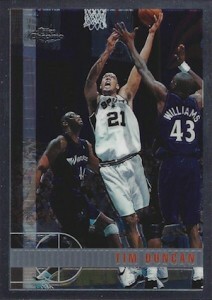 There are two other Tim Duncan cards in the base set, which are included in the Silver and Gold subsets, respectively. The Tim Duncan Finest Refractor parallel is also popular. 8 Card Lot Tim Duncans 6 RC’s With A Game Used Home Jersey. 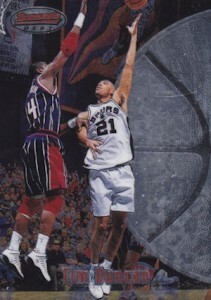 1995 Press Pass #JS4 Joe Smith W Tim Duncan VERY FIRST CARD!! EXTREMELY RARE!!! TIM DUNCAN 2017 18 CHRONICLES 2 COLOR PATCH #5 10 -SPURS!!! 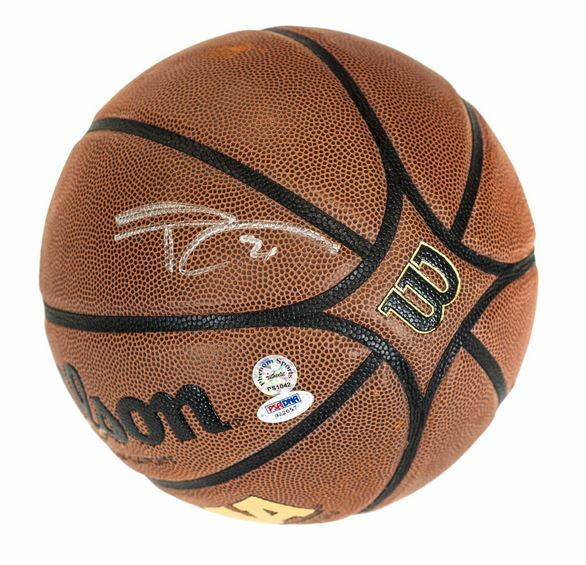 Below you will find an example of what Tim Duncan's authentic signature looks like. This can be used as a first point of reference for determining the legitimacy of autograph memorabilia, but is not a substitute for having your items authenticated by a well respected professional autograph authentication company. Reputable authentication companies include JSA, PSA, Panini Authentic and Mounted Memories to name a few. Click on any of the images below to view full size photos. The "T" is discernible and includes a double vertical line. The entire signature is capped by a series of back and forth lines with an elongated loop forming on the right; each of the lines include some sort of hook or curlycue on the left-hand side. His jersey number is usually present as "#21." A squiggle of lines below the capping loop can be deciphered as a "u-a-n."